Hunan Cuisine consists of three local cuisine styles in the Xiangjiang River valley, Dongting Lake area and mountain area in west Hunan, respectively. Changsha local cuisine is the representative of the cuisine of the Xiangjiang River valley, which is characterized by aromas, freshness, softness, tenderness and a sour and spicy taste. The cuisine of the Dongting Lake area is very popular in Changde, Yueyang and Yiyang. Local chefs are good at preparing dishes with aquatic products, fowls, with thick starch and oil. With Jishou, Huaihua and Dayong as centers, cuisine of the mountain area in west Hunan is mainly prepared with delicacies from land and river, and preserved pork, with salty, fragrant, sour and spicy tastes and a local flavor. Hunan Cuisine has three characteristics: 1. Skilful use of a kitchen knife, a delicious taste and a beautiful shape. 2. Known for sour and spicy dishes by adding various kinds of seasonings. 3. Adopting a wide variety of techniques. Famous dishes: Spicy Young Chicken, Fried Fish Slices, Steamed Soft-Shell Turtle, Steamed Cured Meat, Huofang Whitebait, Dongting Fat Fish Maw, Jishou Sour Meat, Oily and Spicy Tender Bamboo Shoots, and Chinese Chestnuts and Hearts of Cabbages. Well-known Snacks: Huogongdian Fried, Fermented Bean Curd, Sisters' Glutinous Rice Balls, Xiangtan Roll, Hengyang Pailou Tangyuan (stuffed balls made of glutinous rice flour served in soup), Shrimp Cake, Rice Tea, etc. This traditional Hunan dish was first created at the end of the Qing Dynasty. Meticulously prepared, this nutritious course is tasty and aromatic, and will leave prolong aftertaste. It is one of the best courses for the banquet. It is a traditional Hunan dish, symbolizing a happy get-together under the same roof. Also known as Soy Sauce Shark's Fin, it is a traditional Hunan dish, prepared with highquality materials and unique techniques. It is a traditional dish of Changsha. As early as in the 1930s, it enjoyed a high reputation. Customers will gasp in admiration when eating eggs without yolk. 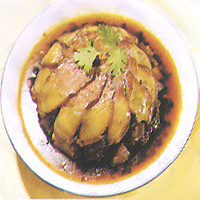 As a traditional Hunan dish, this dish is prepared with eels, in the shape of ancient warriors taking off their robes. Hence the name. 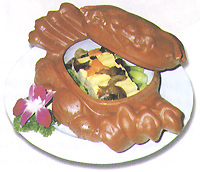 Prepared with unique techniques, this dish has won universal praise and has been well received by customers. Liu Sanhe, a famous chef of Changsha, is good at preparing this traditional dish. These three outstanding dishes refer to Threadlike Stomach of Ox, Soy Sauce Tendons of Beef, and Stewed Ox Brains. Carefully prepared, they are beautiful in color, with a sour and spicy taste, and crisp and tender meat. 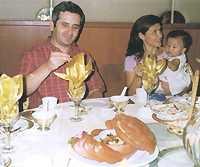 It is a traditional dish served as the first course at a family banquet, symbolizing a happy reunion.